A serious sauce for the serious chili head! This hot sauce combines fruit with a super hot pepper blend and tequila to create a taste experience that you will not forget. Never underestimate the power of a Bison! Try Black Bison Hot Sauce on beef, pizza and poultry. 1st Place Winner Fruit Based Category - World Hot Sauce Awards. 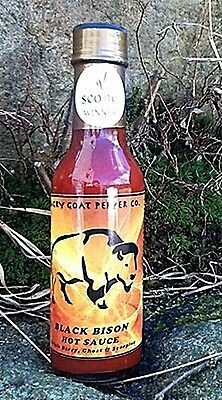 If you have any questions about this product by Angry Goat Pepper Company, contact us by completing and submitting the form below. If you are looking for a specif part number, please include it with your message.